In the fall of 1978, the ancient Shroud of Turin was exhibited publicly for the first time since 1933, thus rekindling the fires of controversy that have raged intermittently around this icon since the first century C.E. Is this cloth truly the authentic burial shroud of Jesus of Nazareth (c. 6 B.C.E.–c. 30 C.E.)? Is the full-sized human image impressed on its coarse fibers the actual physical representation of Jesus as he lay in the tomb after his death by crucifixion at the hands of Roman soldiers? When looking at the shroud, is one seeing a kind of supernatural photograph of Jesus that can accurately depict his actual human appearance? The fourteen-by-four-foot shroud has been kept under guard in a Roman Catholic chapel in Turin, Italy, since 1452, and it has been previously examined by technical investigators in 1973 and 1978. Although at that time the researchers were unable to date the cloth with certainty, scientists at the Los Alamos Scientific Laboratory in New Mexico announced that the burial shroud appeared to be authentic, woven of a type of linen typically used in Jewish burials in the Holy Land about 30 C.E., thus approximating the date of Jesus' Crucifixion. As for the remarkable image imprinted on the shroud, Los Alamos chemist Ray Rogers, stated his opinion that the impression had been formed by "a burst of radiant energy— light, if you will." Such a view is in harmony with gospel references to a brilliant light from heaven and the process of transformation undergone by Jesus at the moment of his Resurrection after three days in the tomb. A statement issued by the Los Alamos Laboratory, operated by the University of California for the U.S. Department of Energy, explains one hypothesis that draws a parallel between the mysterious images on the shroud "and the fact that images were formed on stones by fireball radiation from the atomic bomb at Hiroshima." Many of the experts who have examined the shroud insist that the image was not painted on the cloth, for the portrait is not absorbed into the fibers. Neither could the image have been placed on the shroud by any ordinary application of heat, they argue, or the fibers would have been scorched. The gospel accounts of Jesus' Crucifixion state that he was whipped and beaten by Roman soldiers, who placed a crown of thorns on the head of the man who was identified as the "King of the Jews." The beating completed completed, Jesus was marched through the streets of Jerusalem bearing the wooden cross on his back before he was nailed to its horizontal bar at the place of execution. After his apparent death, a spear was thrust into his side by a Roman soldier. had been used to wrap a crucified man in its folds. The impressions on the shroud are of a tall man with a beard, his hands crossed with the imprints of nails through the wrists and feet. The right side of the man's chest was pierced. In addition, the image is said by investigators to bear the marks of whip lashes on the back. The man's right shoulder is chafed, as if from having borne a rough, heavy object. A number of puncture wounds appear around the head, and one cheek displays a pronounced bruise. The chest cavity is expanded, as if the victim had been trying desperately to draw air into the lungs, a common occurrence and a typical physical response during crucifixion. Since its second examination in 1978, the Shroud of Turin has been hailed by some as physical proof of Jesus' Resurrection from the dead and his triumph over the grave, while others have condemned it as a hoax crafted by medieval monks who sought to create the ultimate in holy relics for spiritual pilgrims to venerate. Ray Rogers is one of a number of scientists who believes that the burial cloth is truly the shroud of Jesus Christ. In his view—and in that of many others—the Shroud of Turin answers the eternal question of whether humans can achieve immortality. "If Christ was resurrected from the dead," Rogers stated, "then the gospels are true, and eternal life is offered to all." In October 1978, the Shroud of Turin Research Project, the U.S. scientific group that examined the shroud, unanimously reported that "the image on the cloth is not the result of applied materials." In their estimation, the man on the shroud was not painted on the cloth and that an unknown event of oxidation selectively darkened certain fibrils of the threads so as to make a superficial image of a man with accurate details valid when magnified 1,000 times. Through some paranormal occurrence the body image is much like a photographic negative. During the September/October 1978 exhibition of the shroud in Turin, more than three and a half million people viewed the relic. The viewing was followed by a Sindonological Congress of experts on October 7 and 8, and on October 8–13, a detailed, around-the-clock, 120-hour scientific examination of the shroud that included more than 30,000 photographs of various kinds. The latter effort was conducted primarily by scientists from the United States who had brought 72 crates of equipment weighing eight tons. Also in 1978, Ian Wilson published The Shroud of Turin: The Burial Cloth of Jesus Christ? in which he presented the results of his historical research which brought continuity, from 33 C.E. to 1204 C.E., to the story of the shroud and its travels. Wilson concluded that the "Face of Edessa" and the "Mandylion of Constantinople" were but other designations for the Shroud of Turin. He also postulated a Knights Templar connection for the so-called missing years of the shroud from 1204 to 1357 which indicates that the relic was in Athens and Bescancon, France, during that period. It may well have been, Wilson suggested, that the extensive copying of the face on the shroud by the Knights Templar could have led to the papal revocation of their charter, which was later followed by the execution of their leaders by the French ecclesiastical court. The Templar involvement appeared to be validated by the discovery of a matching shroud face that was found behind the false ceiling of an outbuilding in Templecombe, southern England, on grounds that had once served as a Templar recruitment and training center. From its earliest years, in legends and in art, there have been claims of miracles and healings through the shroud. Four credible witnesses reported that in 544 when Edessa was threatened with siege by a Persian army, the image was rushed to the top of the city wall and prominently displayed; the army turned and abandoned the attack. Eusebius and others state that King Agabar V of Edessa was mortally ill and was instantly healed when shown the face on the cloth. While the shroud was being carried to Constantinople in 944, it was said that a man possessed of demons was cleansed when he touched it. In 1954, in a small village of Gloucestershire, England, 11-year-old Josie Wollam was in the hospital dying of a severe bone disease, osteomyelitis, in hip and leg, plus lung abscesses. The doctor advised that there was no hope for Josie, and she was given the last rites of the church. However, Josie had learned that retired RAF Group Captain Leonard Cheshire (1917–1992) was giving lectures in the area on the Shroud of Turin, and she told her mother that she was certain she would be able to walk again if she could only see the shroud. At Josie's urging, her mother wrote Captain Cheshire and his office sent a photograph of the shroud face. Merely holding the photograph appeared to accomplish a partial remission of the bone disease, and two weeks later, Josie was sent home from the hospital. The girl was still unable to walk, and she continued to declare that if she could actually see the shroud and be in its presence, she knew that she would be completely healed. Cheshire was so impressed by Josie's faith that he took her with him to Portugal to see former King Umberto II (1904–1983), the shroud's owner, to ask permission for a rare private session with the shroud. Umberto readily granted their request, and Cheshire and Josie traveled on to Turin, where the rolled shroud was placed across the arms of her wheelchair. Cautiously, respectfully, the girl reached a hand into the end of the roll to touch gently the inner surface. At the 1978 public exhibition of the shroud 24 years later, Josie, now 35, walked into the cathedral at Turin, once again accompanied by Cheshire but no longer in a wheelchair. The child who had been given last rites in 1954 had been allegedly healed completely by being in the presence of the shroud. She met Father Peter Rinaldi while at Turin and told him that after her healing she had matured normally through childhood and adolescence, married, had a daughter, and was gainfully employed. While many scientists urged increased usage of carbon-dating techniques to determine once and for all the true age of the shroud, other experts warned that an accurate carbon dating might not be technically possible with present-day laboratory techniques and practices. In the 1970s, two researchers independent of each another suggested that the 1532 fire at Chambery, France, which caused the silver reliquary to drip molten silver onto the cloth, also may have created a "pressure-cooker effect" of driving known contaminants on the cloth into the molecules of the cloth, so that the carbon content would be skewed. At the Rome Symposium of 1993, and subsequently, Dmitri Kouznetsov of the Sedov Laboratory in Moscow asserted that during the 1532 fire the molten silver acted as a catalyst for carboxylation of the cellulose, so that subsequently the cloth became enriched with carbon, thus making it appear to be younger than it may actually be. In spite of such protests regarding carbon-dating techniques, laboratory tests conducted in 1985 reported that 1320 was the median date that the shroud cloth had been woven. As might be expected, large numbers of diligent researchers object to the date of 1320 and the suggestion that some talented artisan in the Middle Ages had created the image on the shroud as a work of piety or as an instrument of deception. Those who champion the authenticity of the shroud point out that the scalp punctures and blood rivulets as seen on the forehead of the man of the shroud have the characteristics and proper location for both veinous and arterial blood flow, and yet, if the shroud were a hoax created in approximately 1320, circulation of human blood was not discovered until 1593. The cloth-to-body distance correlates so precisely that the image perfectly encapsulates three-dimensional data perfectly. When the shroud image is fed into NASA's VP-8 image analyzer, it produces a bas-relief of the man of the shroud with no distortion. No other image, drawing, painting, or photograph has this quality—only star maps and the shroud image; everything else distorts. Other researchers who claim the shroud is authentic point out that the 70 varieties of pollen found on the burial cloth come from the Near East and 38 varieties come from within 50 miles of Jerusalem—and 14 of them grow nowhere else. The Z-twist thread and 3-to-1 herringbone-twill weave used in forming the shroud were known only to the Near East and Asia until recent centuries. The cotton fibers in the shroud linen could have come only by weaving on looms of the Near East. Microscopes were perfected in the period between 1590 to 1610, and yet meaningful data in the shroud image has been found by magnifications up to 1,200 times. How could an artist working in the 1300s have fashioned such details? The feet of the man of the shroud bears smudges of actual dirt that contain travertine aronite, a rare form of calcium that matches the spectral properties of this limestone substance found in caves near Jerusalem's Damascus Gate. No other source is known. One oddity of the shroud image is that it can be seen only in an optimum viewing distance of six to 15 feet. Closer or farther and the image fades out of view. Did the supposed hoaxer paint the man on the shroud by holding a six-foot brush at arm's length? Even the most recent translations of the gospels state that Jesus was nailed to the cross by his hands. But the shroud correctly displays a medical truth: He was nailed through the "space of Destot" in the wrist, because a nail in the soft flesh of the hands would not support a man's weight. Another medical fact is that a spike driven through the "space of Destot" in the wrist will lacerate the median nerve, causing the thumb to flex sharply into the palm. The man of the shroud has no discernible thumbs. Would an artist in the Middle Ages have known such medical idiosyncrasies? The man was crowned with a cap of thorns, typical of the Near East Judeans, not the Greek-style wreath so often depicted in artists' renderings of Jesus' "crown of thorns." The bloodstains on the shroud are precisely correct, both biblically and anatomically. If the shroud had been lifted off the man, one of two things would have happened: If the blood was still wet the stain on the cloth would smear; if the blood was dry it would have broken the crusted blood that had soaked into the weave. Neither occurred, thus leading some researchers to believe that the body must somehow have dematerialized without the removal of the shroud. If the shroud merely collapsed and was not thrown back, then the story of Peter and John's arrival at the tomb after Jesus' Resurrection (John 20:1–10) makes better sense when Peter saw "the linen cloths lying" and John "saw and believed." 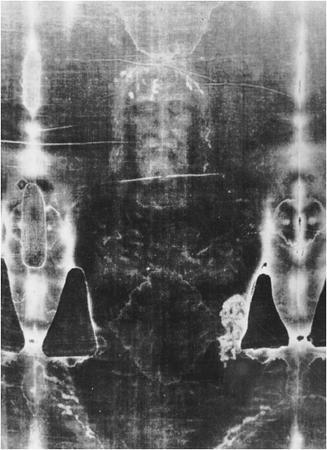 Although the shroud had some contact with Jesus' body, for scientists have decreed the bloodstains on the cloth to have been made by real blood, the body-image is described by some of the researchers as "made through space" by an "image-making process" which they have named "flash photolysis," because the images are not pressure sensitive in that the back and front images of the man have the same shadow and lack of saturation characteristics. If contact with the bleeding physical body was the only factor, the man's lying on his back should have made the image darker and different. Many of the critics of the authenticity of the shroud and its images argue that it is nothing more than a finely executed medieval painting. Some skeptics have even claimed that the shroud images were painted by Leonardo da Vinci (1452–1519). Such an argument was quickly dissolved by pointing out that the great artist was born in 1452, nearly one hundred years after the shroud had been on exhibit in Lirey in 1357. 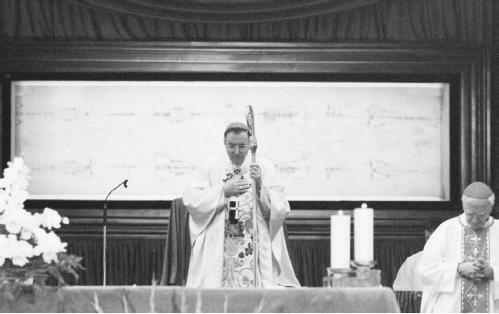 At the scientific symposium on the shroud conducted in Rome in 1993, Isabel H. Piczek of Los Angeles presented her conclusions that the controversial cloth is not and cannot be a painting of any sort, technique, or medium. Piczek is a professional artist with degrees in physics who has won international awards for painting and figurative draftsmanship. She has personally executed art works in every ancient and modern technique known, including nearly 500 giant-size items in public buildings throughout the world. In her opinion, Piczek cautions that the shroud must not be conserved as a painting would be, "or else we may destroy the only object on Earth which is the blueprint of the future of our cosmos." There have always been critics, skeptics, and disbelievers when it comes to the authenticity of the shroud. Even King Abgar's second son, Manu V, was a doubter, in spite of his father's alleged cure after viewing the face on the shroud. The sons of the Byzantine emperor were also skeptics. Bishop Henri de Poitieres of Troyes (fl. mid-fourteenth century) vacillated between praising the exhibition in Lirey, then trying to have it closed down. His successor, Bishop Pierre D'Arcis (fl. late-fourteenth century), attempted to stop later showings of the burial cloth in Lirey, but the pope ordered him to cease such efforts or face excommunication. Critical researchers in the twentieth century found an alleged memo from Bishop D'Arcis written in 1389 and presumably intended for the pope in which the bishop claimed to know the identity of the painter who was responsible for creating the shroud images. The French scholar Ulysee Chevalier (1841–1923) believed in the testimony of the memo and so did the Jesuit Herbert Thurston (1856–1939). Dr. John A. T. Robinson, the English theologian, also accepted the document at first, but he later rejected its allegations and accepted the shroud as genuine. In the 1990s, Parisian researchers determined that the so-called "D'Arcis memo" was no memo at all, but merely a clerk's draft in poor Latin, never dated nor signed nor sent to the Vatican, and with no official copy in either Troyes or the Vatican archives. In sharp contrast to those critical researchers who attempt to diminish the shroud's credibility are those scientists of faith who are personally convinced that the shroud is truly the one that briefly enveloped the body of Jesus Christ and that the images on its cloth were made by a supernatural energy as part of a spiritual event that Christians call the Resurrection. At the Rome Symposium of 1993, Dr. Gilbert R. Lavoie of the Fallon Clinic, Worcester, Massachusetts, demonstrated that the blood and body images on the burial cloth are of a man who had been suspended upright as if hanging on a cross. According to tradition, the body of Jesus hung on the cross from 9 A.M. until 3 P.M., and he was not placed on his back within the folds of a burial cloth until about 5 P.M. Thus, according to Lavoie, a truly spiritual image resulted on the shroud in order for the image to show Jesus as if hanging on the cross. Pope John Paul II (1920– ) authorized public exhibitions of the shroud for April 18 to May 31, 1998, and for April 29 to June 11, 2000. Among the latest findings prompted by the most recent showings was the report by two Israeli scientists who stated in June 1999 that plant imprints and pollen found on the shroud supported the premise that it originated in the Holy Land. Avinoam Danin, a botany professor at the Hebrew University of Jerusalem, said that the shroud contained images of some plants, such as the bean caper (Zygophyllum dumosum), which grows only in Israel, Jordan, and Egypt Sinai desert. The rock rose (Cistus creticus) which grows throughout the Middle East was also detected, along with the imprint of a coin minted in the reign of the Roman Emperor Tiberius (42 B.C.E.–37 C.E. ), who ruled at the time of the Crucifixion. Clearly, while a number of scientists debate the accuracy of the radiocarbon dating results—some insisting that the most reliable results date the shroud to 1260–1390—and others defend the authenticity of the burial cloth and argue that it was the one that wrapped Jesus' crucified body until the cosmic event of the Resurrection, one can only echo the words of Archbishop Severino Poletto, the shroud's custodian: "The last word has not yet been said." Riggi, Giovanni. The Holy Shroud. Roman Center for Shroud Studies, 1981. Shroud of Turin Research at McCrone Research Institute. http://www.mcri.org/Shroud.html. 14 August 2001. Shroud of Turin. http://www.shroud.com. 14 August 2001. Tribbe, Frank. Portrait of Jesus?—The Illustrated Story of the Shroud of Turin. New York: Stein & Day, 1983. Wilson, Ian. The Shroud of Turin: The Burial Cloth of Jesus Christ? New York: Doubleday, 1978. I believe the schroud is undeniably real and it does take Faith to believe and I also believe if I touched it I would be healed as the man with demons. You must believe is Jesus all your heart mind and soul He is our savior and Died for us and rose again on the third day and lives in heaven preparing our new house in Heaven. And He is comming very soon so be ready and prepare others for the end times.